Attleborough is a market town situated within the district of Breckland with a population of 9,700 (2001 census) and located on the key A11 trunk road with a rail station on the Norwich to Cambridge line. 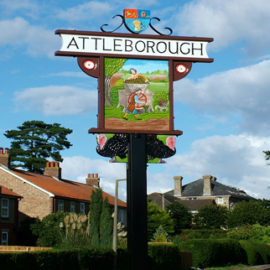 The Town Council is the local level of Government for the town of Attleborough under the provisions of the Local Government Act 1972. Town Councillors, numbering fifteen are elected for a term of four years. The two wards for the town are Queens and Burgh/Haverscroft. Five District Councillors for the town serve on Breckland Council. In 1998 Attleborough Town Council acquired and refurbished premises at Queens Square which now serves as the Attleborough Town Hall and Archive Room. The clock for the hall was donated by Attleborough W.I. The hall is used for meetings and incorporates offices for Citizens Advice Bureau and Tourist Information. 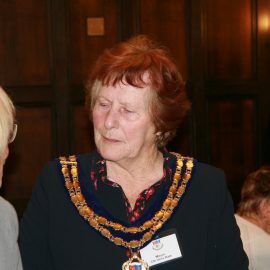 The Mayor, who wears a chain of office consisting of a medallion and engraved Silver Gilt plates with the names of previous holders of the office, and Deputy Mayor are elected by the Town Councillors annually. The Town Council has responsibility of various recreation grounds, Decoy Common, the cemetery and St.Mary’s Churchyard. The council support various organisations within the town through grants, including the Citizens Advice Bureau, Youth and Voluntary organisations and Attleborough Town Charities. Monthly meetings of the Town Council are held on the first Monday of each month, save for Bank Holidays, to discuss planning and general issues affecting the town. The Town Council derives its income from a precept paid by Breckland Council. Representatives from the Town Council are appointed to many local bodies including Attleborough Charities, Connaught Hall and Board of School Governors. Office Hours: Monday to Thursday 10 am to 2 pm and Friday 10 am to noon. If you require an appointment outside of office hours please contact the CEO & Town Clerk.